By the end of Fashion Week, editors are the walking dead in Louboutins and Jimmy Choos. As fun as it looks, trekking from show to show without a second to breathe, eat or sleep is not for the faint of heart. The Future of Fashion lounge, hosted by TV personality and style expert, Robert Verdi, was the perfect antidote for stressed writers, bloggers and even celebs. Nestled in the center of the Fashion Week circus, the Luxe lab was transformed into a fashion and beauty oasis, with makeup, hair and nail applications and cocktails courtesy of the new Absolut Berri Acai. Celebs, like June Ambrose and Miss J, who I ran into getting his nails did, stopped by to take a much-deserved break between shows and mingle with the creme de la creme of the Fashion world. Once you get the Robert Verdi stamp of approval, it’s a known fact that you’re on your way to a whirlwind of success. And that success is well-deserved. Each brand he embraces has something special about them—whether it’s a fresh take on makeup packaging or innovative shapewear technology that’s nowhere else on the market. 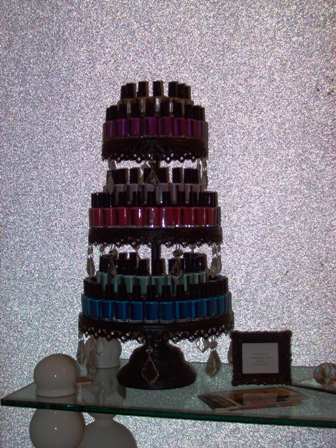 Robert Verdi’s nail lacquer line of choice? Ginger & Liz. The haute nail polish brand, which I covered on The Glamazons in November, was founded by model/author, Liz, and entrepreneur, Ginger. With sassy names like “Put a Ring on It,” “Swagger,” and “Boss Lady,” each color is rich, chic and fashion-forward. Celebrity nail artists like Kimmie Kyees (Rihanna, Britney Spears, Katy Perry) and Tracy Lee (who works at Damone Roberts salons) say the quality of the Ginger & Liz line is just as great as the color choices. While hooking up my mani, my nail tech said “the polish is thick and only needs a few coats, and lasts longer than most nail polishes on the market.” And she’s absolutely right. A week later, my nail polish hasn’t chipped at all. Me getting my nails done. Yes, I’m always on the phone. Finished product—isn’t it amazing? The gray color and “Caution” are a match made in heaven. 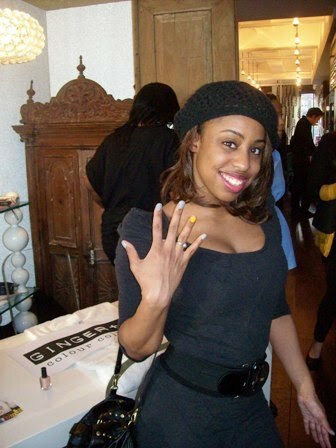 Miss J painted each nail in a Ginger & Liz hue to match his fierce multi-finger ring. Werk! 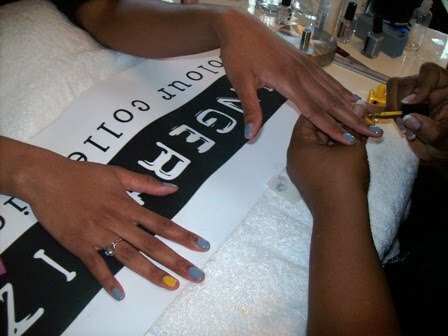 June Ambrose posted a Twitpic of herself getting a cute Ginger & Liz mani at the lounge. While sipping on Absolut Berri Acai (which mixes amazingly well with everything from juice to champagne. 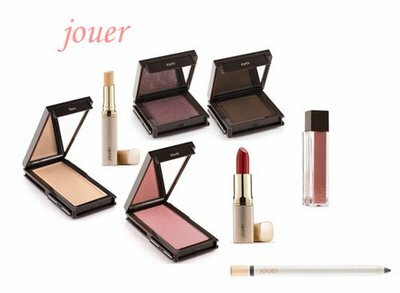 Trust me, I’ve tried), I checked out the Jouer Cosmetics makeup stand, which is a French line of chic and modern cosmetics. The intelligent packaging for Jouer, which means “play” in French, allows you to do just that. You can attach different shadows to customize your portable makeup palette. Fabulous! 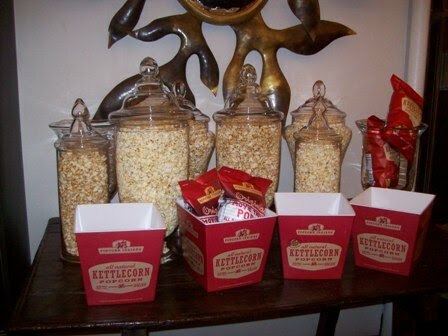 Once Beautylicious and my nails were hooked up and faces were beat, we snacked on the delicious Popcorn Indian Kettle Corn (see below, yum!) and checked out the fashion brands. Robert Verdi featured the new Maidenform bra that adds two cup sizes to your bustline and ShaToBu shapewear, the innovative brand that burns calories while you wear it! I need ShaToBu in my life pronto to get right and tight for the summertime. Check out some pics of us hanging out at the lounge below! Fun times. 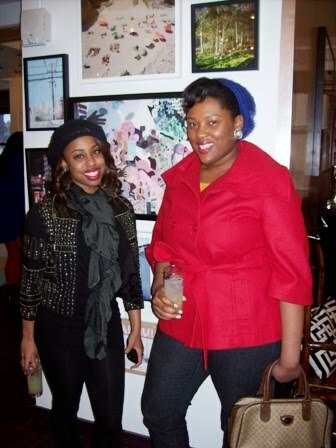 Beautylicious and I looking pretty and sipping Absolut Berri Acai and lemonade earlier in the week. Here’s this adorable model I met at the lounge! I had to take a pic with him. Fierce. 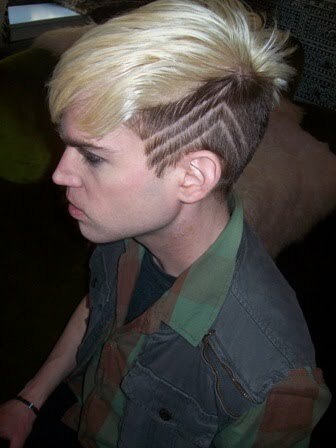 His cut was some kind of amazing.